Relaxing Spa Feeling – that feeling you get when you walk into Infuse Skin and Body and instantly feel relaxed! I wanted to share with my blog readers the IPad app I use when people are under LED after a microdermabrasion, HydraFacial, Spa Facial or before a chemical exfoliation. Download it, and take a half hour to yourself at home to unwind and get that relaxing spa feeling at home. 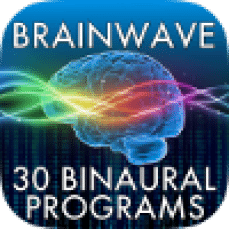 It’s called BrainWave – 32 Advanced Binaural Brainwave Entertainment Program. It is just $3.99 and well worth it. There are 32 different programs to choose from that stimulates brainwave frequencies associated with different states of mind. The different programs include Morning Coffee – to get you going, Meditation – to put you in a meditative state, Pre-Exercise to elevate mental and physical energy and many to put you in that spa relaxation state of mind – Calm Reflection, Deep Relaxation, Dreamy Sleep and Power Nap. Some of my clients that get LED skin treatments are familiar with this. When they relax under the LED light, they are given a choice of listening to guided meditation, music or brainwaves. I usually use the deep relaxation program, but I had a client that was going to work out after her treatment, so we put the Morning Coffee program on for her. It was interesting, because she normally gets that relaxing spa feeling under the LED light but this time, I could see her moving and twitching under the LED because of the BrainWave program we selected. Recently, I was flying back from Florida and really wanted a nap on the plane. I usually can’t sleep on the plane, so I put my earbuds in and selected Power Nap on my IPad. I could literally feel myself falling asleep. The next thing I knew, the airline attendant was tapping me on the shoulder to check if I had my seatbelt on because we were getting ready to land. Because I hadn’t gotten to the wakeup portion of the program, I listened to Morning Coffee, and was filled with energy for the rest of the day. For that relaxing spa feeling at home here’s the link to Brainwaves in ITunes. I hope you enjoy, and leave a comment if you download it and like it.